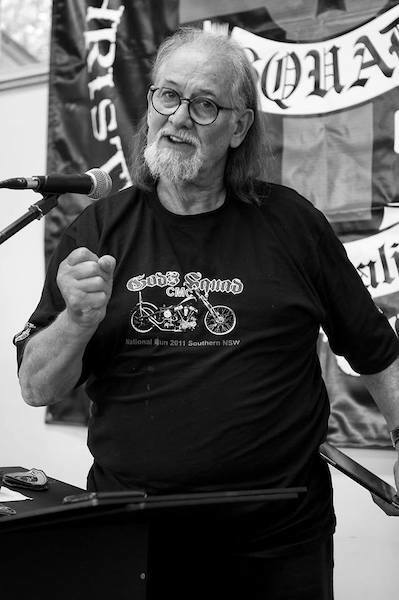 God’s Squad Christian Motorcycle Club was established in the late 1960’s in Sydney and founded on a broader basis, under the leadership of John Smith, in Melbourne 1972, where the Club Colours have been flown ever since. The Club primarily exists to minister among the ‘outlaw biker fraternity’ and associated groups, where it is an accepted and relevant expression of the Christian Church. Since it’s birth, out of the counter culture Jesus movement days of the late 60’s it has continued, over four decades, to devote its efforts amongst those on the fringes of society. In March 2019, John Smith passed away, in the loving arms of his wife Glena. The logo and club colours of God's Squad CMC are copyright and registered as a trade mark. Reproduction without the prior consent from God's Squad CMC is strictly forbidden. This website is a compilation of information which is protected by copyright. Unauthorised redistribution or diffusion of this is prohibited.